Kate Stanley of the Minneapolis Star Tribune has written, “His visits have marked the human story since its earliest chapters. He stands beyond the circle of civilization in gentle judgment, taking note of youthful struggle and triumph. He looks on as children strive to do right, to heed their elders, to earn a miracle. When the darkest moments loom and hopes are high, this visitor crosses the threshold before the dawn to leave a message. He brings possibility, astonishment and delight.” Kate is talking about Santa. 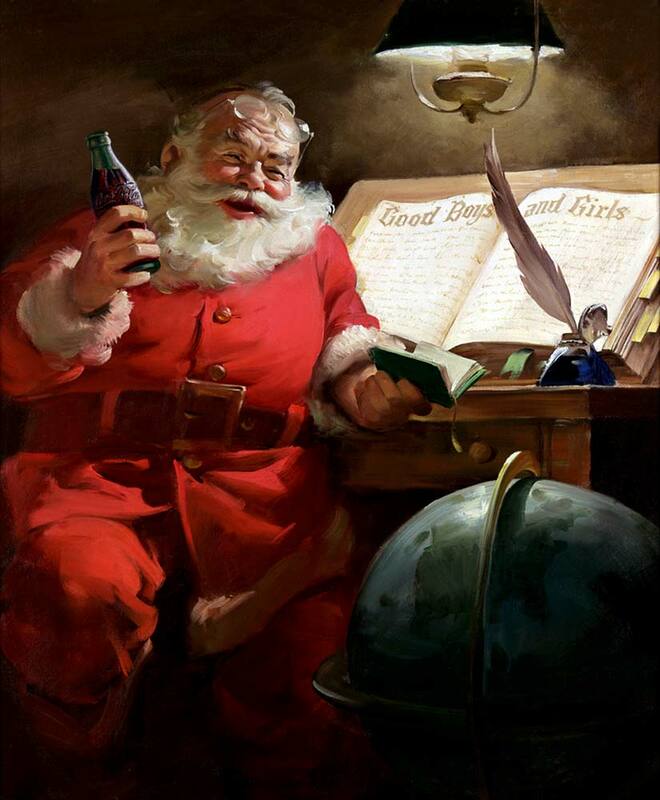 In 1931, The Coca-Cola Company commissioned Michigan-born illustrator Haddon Sundblom to develop advertising images using Santa Claus. Sundblom turned to Clement Clarke Moore’s 1822 poem, The Night Before Christmas. 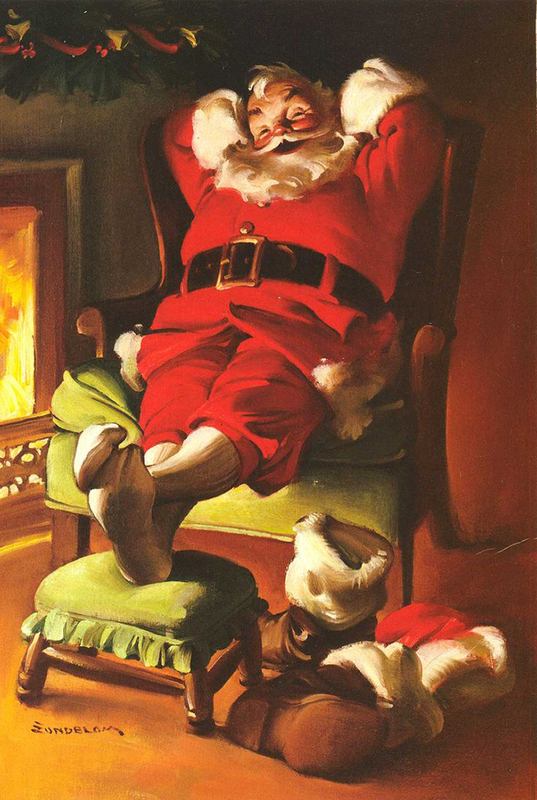 Moore’s description of the man as “chubby and plump, a right jolly old elf” led to an image of Santa that was warm and friendly, his face aglow with his sunny disposition. In the beginning, Sundblom painted the image using his neighbor, retired salesman Lou Prentiss as his model. Later, he looked in a mirror. For 35 years, Sundblom painted Coke-swigging portraits that defined the modern image of Santa. The buckled boots, baggy red trousers, big red coat trimmed at top and bottom in white fur, wide belt, white bushy beard and matching hat — all came out of Sundblom’s studio on the eighth floor of Chicago’s Wrigley Building. Today, when New York City interviews aspiring Santas, it goes by Sundblom’s standardized template. 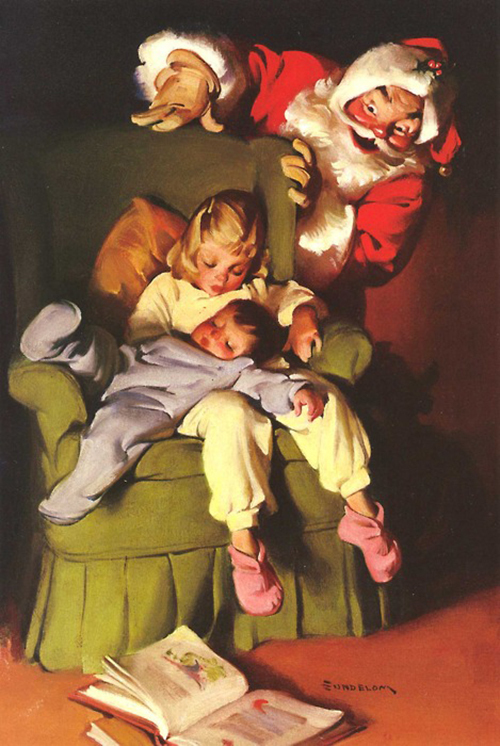 The story is beautifully told and illustrated in the 1992 book by Barbara Charles and J. R. Taylor — Dream of Santa: Haddon Sundblom’s Advertising Paintings for Christmas. Haddon Sundblom (1899-1976) was Coke’s most prolific artist, painting subjects that ranged from bathing beauties to soda-fountain scenes. They are actively collected today. During his peak period in the 1940s, he produced half of all Coke’s advertising art — billboards, point-of-sale, the back cover of every December issue of The National Geographic. Partners in his studio reported that he worked quickly and often completed more than one painting in a sitting. Like many “deadline artists,” (and the “big guy” he was often painting) “Sunny” Sundblom could work all night. Esoterica: In Myanmar he’s known as Generous Pho Pho. In Moldavia he’s called Mos Craciun. In Suriname, Goedoe-Pa. In China they have a character called Shengdan Laoren. The idea of a wise old man who gives gifts to children comes from antiquity. Kris Kringle, Father Christmas, or Santa Claus, the visualization of our myths is the work of artists. The building of our myths is the work of artists. This letter was originally published as “Haddon Sundblom” on December 24th, 2004. This timely letter is inspiring, It made me decide to try to find a source for all (? can you help?) Sundblom’s Santa paintings so I could select a couple to find, frame and hang, for that feeling of kindness and to slow the pace of the world around me. These were and are classic images. Art defines the ages better than anything else. Good luck! I am so appreciative of these interesting, inspiring and educational “letters”. Kindness, yes, working together and inspiring each other instead of being in competition…what a thought. What a way to live. Thanks again Robert and Sarah….. The building of our myths, our culture and our future is indeed the work of artists. So true going right back to cave people. Sundblom made it look easy! I’ve tried my hand at painting Santa and my efforts don’t come close !! Perfect choice for an enriching holiday article! Thank you! Merry Christmas! Like this post from Painters Keys. Beautiful Santas! I wish I was a student of this great Artist…thanks for the piece, and merry Xmas to all of you out there. Thank You for this information and beautiful images. A very Merry Christmas and Peace on Earth to all.